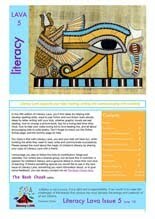 The fifth issue of Literacy Lava, a free pdf for parents or anyone who wants kids to love reading, writing and communicating, is now available from my website. Clicking on this link will take you to the exact page where you just have to click the cover of Literacy Lava 5 to download it as a pdf. In this fifth edition of Literacy Lava, you’ll find ideas for helping kids develop spelling skills, ways to pair fiction and non-fiction read-alouds, ideas for letter writing with your kids, whether graphic novels are real reading, how to unwrap a picture book, tips for a loving bed-time story ritual, how to help your video-loving kid to love reading too, and all about encouraging kids to write poetry. Don’t forget to check out the Online Extras page, and the Activity page for kids. How exciting!! I think this edition truly is HOT stuff! Will post on it this arvo when we get home. Konnichiwa! It's good to have you home! As always Book Chook, Literacy Lava has great material! Thank you to all who put it together. Thank YOU for the feedback, Carol! Great stuff, thanks for sharing. And I shall go and share further. Congratulations on the fifth edition!! Wonderful information - can't wait to share it. I just know BEA would have been worth all that digging, Terry. Good to have you back! Hey Valerie! We're hoping we can have YOU back with us soon. Another great issue, Susan! You're providing such an amazing resource for families and educators -- thank you! Melissa, I'm thanking you in return! Without great contributors like yourself bringing us articles to make us think, act and share, Literacy Lava would be a shell!